The sultry weather in Bratislava continues, and the yearning for countryside escapes grows in proportion. So yet again we found ourselves heading out to explore one of the many outdoor adventures in close proximity to the city. This time we were bound for Stupava, 15 km north of the centre, for the hike up to the romantic ruin of Pajštún Castle. The castle is one of Bratislava region’s best-kept secrets – at least in terms of fortresses. Bratislava’s own castle, or if not Devín Castle, grab all the foreign visitors and leave Pajštún alone and lovely high up in the forests of the Malé Karpaty (Small Carpathians). There are several ways to get to Pajštún: it’s a hearty five- to six-hour hike from Bratislava through the Mestské Lesy (quickest on the blue trail from Pekna Cesta in Rača, but accessible too via the Marianka pilgrimage route utilising either the yellow trail from Pekna Cesta or the red trail from central Bratislava) or by good paths from both Marianka and the village of Borinka just to the north-east (just a couple of hours’ hiking from these last two). But we began in Stupava, a town just off the E65 road heading north to Brno. It fancies itself as a separate town but is in reality little more than a commuter satellite of Bratislava. As ever, Englishmaninslovakia went with high hopes, as I’d heard of Stupava’s beautiful town park and wanted to check it out. In fact, first impressions were good. The town had a church and, yes indeed, a striking chateau, all with a new lick of paint on an attractive cobbled central námestie. But the church was closed (only one old lady hobbling up to inspect the new notices about the just-deceased by the gates), and the chateau is a senior citizen’s home. However, they were very lucky old people, because their copious, lavish, exclusively-for-old-people castle-like abode looked our, from the rear, upon the most beautiful urban park within the Bratislava region. Zámocký Park is by far the superior of Bratislava’s Medicka Záhrada or Horský Park. 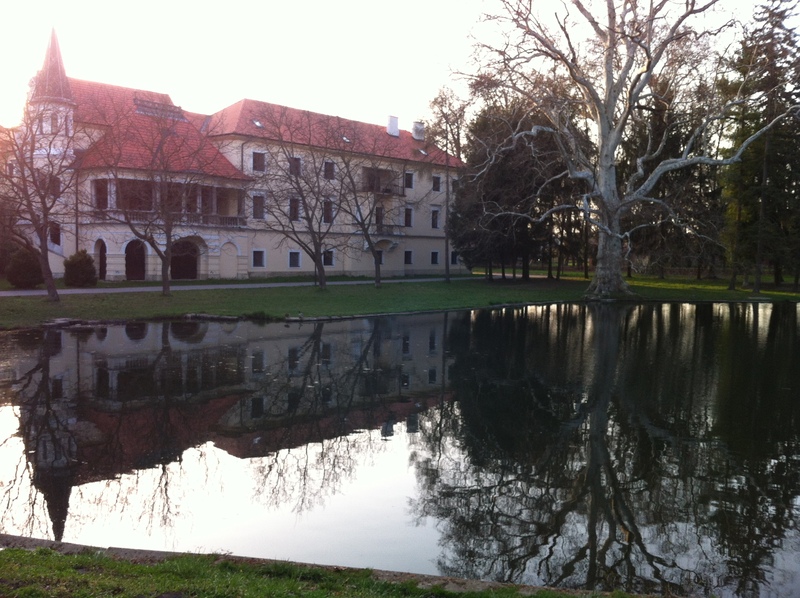 The castle-backed lake is flanked by a few examples of Slovakia’s protected trees (nb – I’ll post the name here when I remember it) and a path leads away through manicured grounds in a manner reminiscent of an English country estate to connect up with the trails into the mountains after about 30 minutes’ walk. 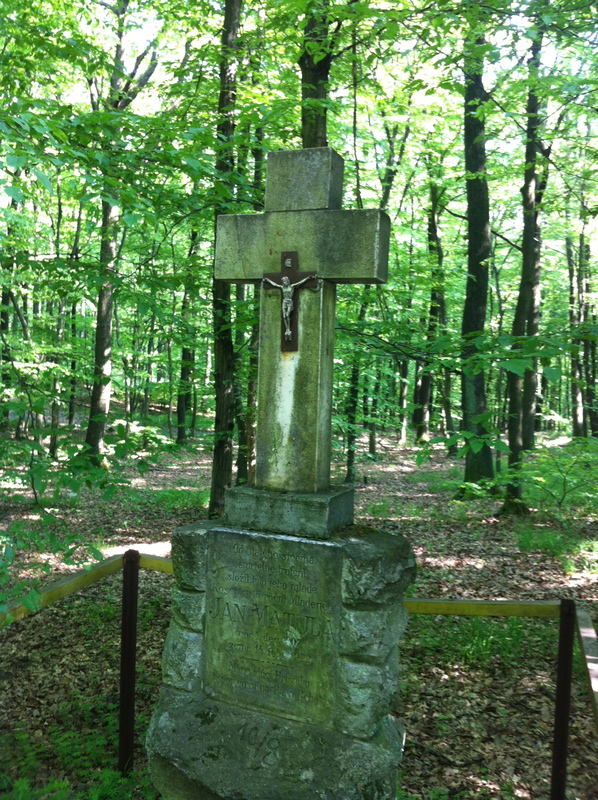 We took a bit of a shortcut and headed along by car (the next turning right after the park from the main road) to the cross which marks where the Zámocký Park path comes out. There is parking just before the cross, and it’s a one and a quarter hour walk from here up through woodlands to Pajštún ruins, which you see from below leaning gutturally out of the wooded hills above you. If signs are to be believed, this is a forest where you can bump into the mouflon (big-horned wild sheep). We didn’t see any, but on the quiet paths near the castle we did cross paths with the biggest herd of wild deer I’ve ever seen in my life – at least 15, bounding through the trees just above us. On the way up, there is one point where the yellow-waymarked path veers almost without warning up off what looks like the main track, and the path is steep in places, but generally, head up and you shouldn’t miss the castle. It does appear, at times, as if the castle does not want to be found. It’s so secreted by trees that it only becomes visible right at the last moment. 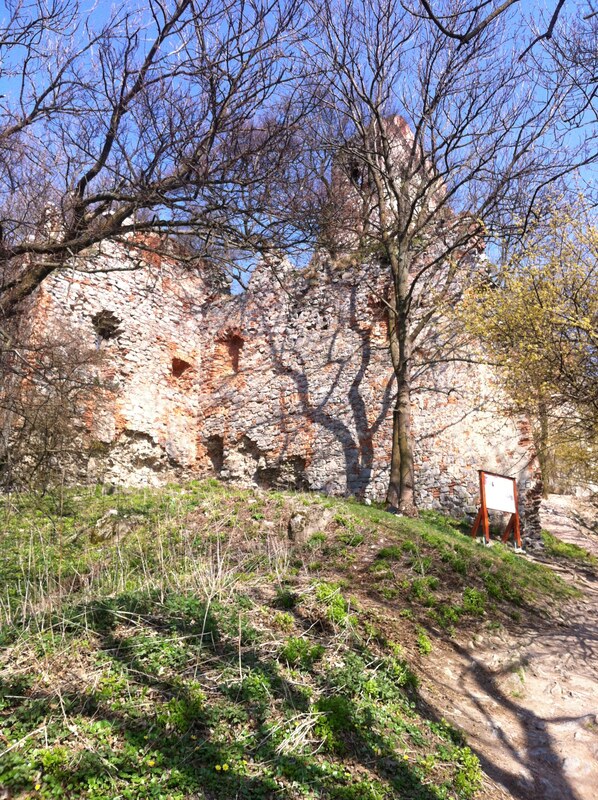 The castle was built in the late 13th century (1287) during a wave of Tartar-Hungarian conflict in the region. Powerful regional families, who invariably had as much power as the official monarch in these war-torn times, didn’t shirk to battle the Crown itself, and the Kösegiovcov family were one such audacious group. As a reward for helping them in battle, Rugerius of Tallesbrau received the very lands on which Pajštún was then built. I did a fair amount of oohing and aahing at just what a defensive masterpiece this castle is. Despite being struck by lightening in the 18th century and then blown up by Napoleon in 1809 (what a nasty fellow to blow up an already ruined castle eh?) the castle is still incredibly in tact. 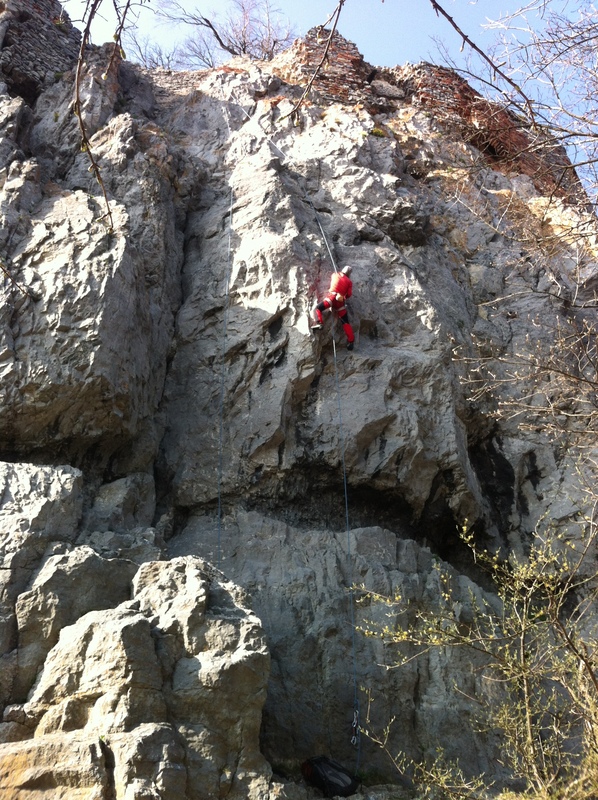 It’s so surrounded by trees it’s hard to get an overall perspective picture, but from the shot below you can see just how vast the walls are: mighty enough to have become the Bratislava region’s best (natural) climbing spot! Anyway, this is a great castle to explore, even if you don’t fancy the rather giddying climb up the cliffs of the ramparts to get there. Kids will love the ruins too. There’s great picnicking spots and fabulous views of Stupava, Borinka and, in the distance, Kamzik. In fact, the castle continued to dominate even after its decline, and Borinka was actually known as Predtym Pajštún (the translation of which is something like village under Pajštún) until 1948. The paths continues on the other side of the castle (if there were few walkers before, on this side of the castle there’s almost none) and loops round on red and blue trails for a further two hours or so back down to the cross and the walk back through the park to Stupava. The info board below the castle entrance also displays one of those cool Slovak myths – featuring the castle and going something like this: the lady of the castle meets a beggar woman with two children who asks for some food. The lady refuses because she has a fit of jealousy about the beggar-woman’s fertility. The beggar-woman gets irate and puts a curse on her. She will give birth to not one but eight children and endure 16 years of misery to boot. The prophesy comes true. The lady of the castle gives birth to eight children, keeps one and tells some other dignitary/attendant to take the other seven into the woods and kill them. The dignitary/attendant has a change of heart and decides he’ll raise the seven kids himself (they’re all sons by the way). Years pass. All the time the lady of the castle is ruing her decision (well, it was quite harsh). The time comes when the seven sons are due to celebrate their passage into manhood (by now they’re 16 years old). The dignitary/attendant has kept their survival a secret from the lady of the castle, who is of course invited to the festivities, sees the seven beautiful young men she asked to have killed and repents. They forgive her; everyone lives happily ever after. NB: Admission to the castle is free and year-round. GETTING THERE: Slovak Lines run hourly buses to Stupava from Bratislava’s Mlynské Nivy bus station (which is just the other side of Medicka Záhrada in the Nové Mesto/Ružinov area). Marianka, another start-point for the hike to Pajštún, is within the Bratislava public transport zone, and is therefore accessed by city bus 37 from the Most SNP bus station (a bit more convenient to get to). It’s 0.90 Euros to Marianka or 1.50 to Stupava. Like the Tower of London, like the Eiffel Tower, the thing that puts you off wanting to go to Kamzík, the big TV tower/mast standing sentinel over the hills above Bratislava is that it is, perhaps, too obvious. There is admittedly not much subtle about it: nigh-on 200m of steel and glass jutting out of an already prominent forested ridge that itself sticks up another 300m above the city, and visible from pretty much everywhere in Greater Bratislava – oh, and Eastern Austria too. And, sharing its name with a type of High Tatras sheep-goat… that’s just weird. But engaging in the obvious never seemed to be a problem for the majority of people – and certainly not for the majority of tourists – before. And voila, the crowds do converge on mass to the Tower of London AND the Eiffel Tower, yet even on a clement weekend afternoon, Kamzík can hardly be described as a crowd-puller. No, not even by Bratislava’s standards (the castle grabs ten times the numbers of visitors and the viewing platforms there are about 300m lower). But of course, I hear you shout, you can’t compare the Tower of London or the Eiffel Tower with Kamzík! Well watch me. I have. And it is genuinely perplexing to me that more visitors to Bratislava (or locals) don’t make it up here, because if you weight the attractions up in minutes of time you need to fully appreciate them, Kamzík comes out on top out of the three. And even for those visitors that would not go quite so far in their commendation, heading up here is well and truly cemented in the top ten best things to do in the Slovak capital – quite possibly the top five. I am a very recent Kamzík convert. For a full year of living under its steely gaze, I had known, pretty much, what there was to see and do there. I had jogged around it. I had embarked on some great hikes from it. But at best I had viewed it as, well, the way most people tolerate TV masts in beautiful forests, with reluctant tolerance and a faint wish that it had either not been constructed or at least been constructed in a nobler architectural style. What’s the big deal then? Well, to be clear the area known as Kamzík is not just a TV mast. 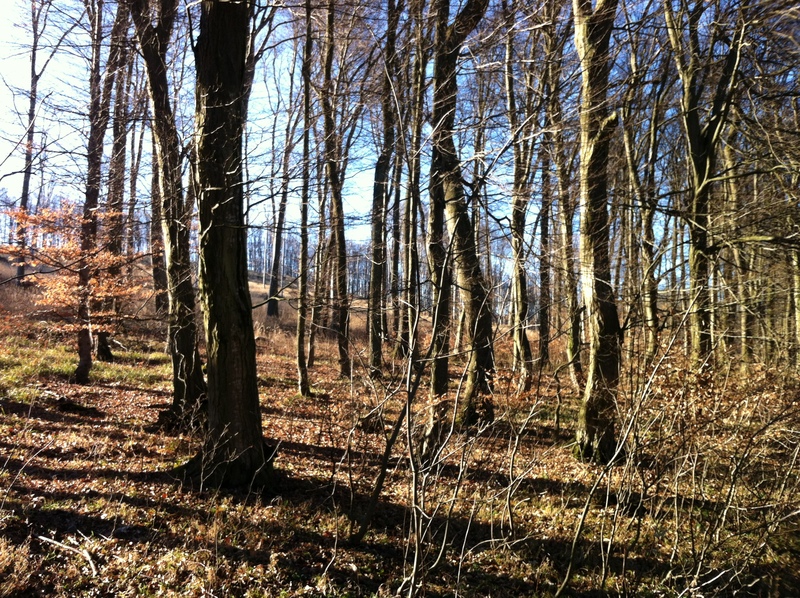 It’s one of Bratislava’s premier outdoor playgrounds: marking, most significantly, the start of the Bratislava Mestské Lesy, a 30 square kilometre expanse of forested leading directly onto the Malé Karpaty or Small Carpathians, beyond (hundreds more kilometres of forested hills await). And – as outdoor playgrounds are often blessed with – so the Kamzík area has great places to eat, great places to picnic, great places to hike and bike, great viewpoints AND, whilst it’s conveniently close to the city centre, it’s also far enough away to feel that you have truly left the city behind, and are in fact embarking on an adrenalin rush of an outdoor adventure. The Mast Itself – and its Views! The TV mast stands on the highest natural point around: a tree-coated 439m-high hill which would not – were it not for the 196m-high tower on top of it – afford any views whatsoever. But 439m + 194m = 633m, meaning this mast’s crest is significantly higher than anything else around. And even the brasserie here – poised 100m up the tower – is at 539m without contest the best viewing point for a very, very long way. The Brasserie gives views on three sides (although the glass could use a clean). East of here, the Bratislava Mestské Lesy/Malé Karpaty stretch into the distance enticingly. 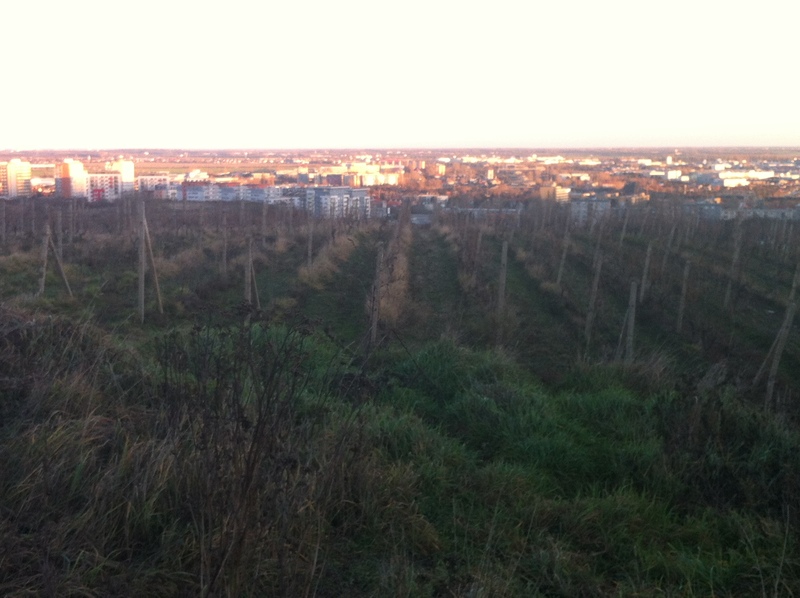 South, the entire sweep of Bratislava is visible across the woods and vineyards, from Rača in the northeast round to the city centre (look for the castle for orientation). Looking west, the view is dramatic too: western suburbs like Dubravka give way to the flat lands beyond the hills, and Austria. You can trace the silver ribbon of Danube from the southeast near the Danubiana Art Museum right across to Devínska Kobyla in the west and beyond to Hainburg in Austria. Even the Austrian Alps are visible in the distance. Below the Brasserie, the Altitude Restaurant yields similar views: with the neat difference that – let’s emphasise again – it rotates a full 360 degrees every 45 minutes. There are, these days, not so many fully rotating restaurants in Europe – and certainly not many with this vista out of the window(s). It’s a great location for a business appointment – but not just because rotating restaurants invariably tend to attract the well-heeled. No: it’s a smart venue and knows it and to an extent tailors itself to attracting just that sort of crowd. It’s also right in the middle of Bratislava’s trump cards: its surrounding nature and its views. And there are conference rooms beneath. Peruse your menu in either eating establishment and you can get the scoop on the Kamzík’s history. It was started, for example, in 1967; finished in 1975. Most hilariously, it details that the original design was intended to depict a wine bottle in homage to the Small Carpathians famous viticulture – with a disclaimer afterwards saying that it does not represent a wine bottle very faithfully and yet retains the nature of a wine bottle shape! In a word: cheers! Being able to drive up to Kamzík (and its proximity to Bratislava city centre) is certainly what makes it one of the very most popular places in the entire Malé Karpaty range of hills. And because you can drive up, it’s also a very frequented picnicking place. But all picnickers like a view, and the wide grassy meadow, or luka, at the top (where the road up through Koliba from the city branches into the TV Tower access road and the cable car access track) offers one of the rare opportunities within the hills to see the woods outside of the trees, as it were: with views the trees normally hide. It’s a sun trap when the sun is shining and has a few snack stalls at the top end: nothing special but hey, sausages with a view!! (or bring your own better food with you). In addition to the eating places mentioned thus far, there is also, at the topmost cable car station, the rather appealing Koliba Expo restaurant – a great, typically rustic slovak-style place to round off a spot of weekend hiking (so good it warrants its own post, but for now, open 11am-11pm daily). Want to bed down up in the hills here? Well it makes a fairly attractive proposition in some ways. You are properly immersed in the nature here, but at the same time within a 20-minute walk of the trolleybus terminus (trolleybus 203). So welcome to Kamzík’s own hotel: Hotel West. The setting is Hansel and Gretel-esque but the rooms and restaurant are a little short on atmosphere (something they have in common with almost every other Best Western). Still, you’re staying in the woods! And yes, there is indeed a cable car up to Kamzík – that was not a mistake – which you can read more about in the How to Get There section below! Views viewed, picnics picnicked and eateries eaten in, chances are you’ll want to get on with some of the great hiking, mountain biking and (in the winter) cross-country skiing hereabouts – numerous relatively deserted trails meander off through the forests seemingly tailored to these purposes. The main hiking trail to know about from here is the red route, the Štefánikova magistrála***(trail of Štefánik) that runs from Devínsky Hrad (Devín Castle) through Devínska Kobyla and Kamzík on northeast over 100km up the length of the Male Karpaty to the very end of the range at Bradlo, where Štefánik’s memorial sits (the whole walk will soon be featured on Englishmaninslovakia and Kamzík sits neatly at the finish of Stage One and the beginning of Stage Two of the walk). OR follow the access road along the top of meadow we just told you was great for picnicking (hikers/bikers only, no cars) as it twists down to the cable car base, where you can pick up the Pilgrimage Route to Marianka***(turn right, following the yellow trail – and see here what Marianka actually is). A yellow trail also heads west from Hotel West at Kamzík to the Železná studnička (scroll on down below under the ‘How to Get There’ paragraph for what Železná studnička actually is) road and directly over to join the official pilgrimage trail to Marianka (yes, we admit it, our pilgrimage trail is not the official one for all of the route, but we’ll guarantee you it’ll take you through the best scenery). Reasonably seasoned mountain bikers could manage any of the afore-mentioned trails on two wheels, but to link up with the prettiest of the nearby dedicated biking trails, take the red Štefánikova magistrála trail northeast for 25 minutes where you’ll hit a yellow trail. The route from here, both east (through to Bratislava’s northeasterly suburb of Rača) and west (down to the cable car base just beyond Železná studnička and then on towards Marianka) is a beautiful biking trail and it’s also our recommended Pilgrimage to Marianka route. When the snow falls up to 1.5 metres thick here in the winter this same trail is a great cross-country snow-shoeing or skiing route. Oh – and there are a whole network of special running routes around Kamzík too – on a mix of paved and stony paths/tracks. The bottom line is that from Kamzík, the whole of the Small Carpathians are at your fingertips. We’ll list the ways to get up to Kamzík in order, from least interesting to most. From just east of Bratislava Hlavna Stanica mainline railway station (MAP) a road (named Karpatska) goes up under the rail tracks through the neighbourhood of Koliba to the afore-mentioned picnicking meadow and a couple of car parks. Trolleybus 203 heads up to the Koliba terminus. From here, keep heading uphill on the road and join a path on the right of the road which leads up through woods in 20 minutes or so to reach Kamzík. A number of possibilities from the city centre: the red Štefánikova magistrála trail runs up from the western neighbourhood of Patronka (at Vojenská Nemocnica, on the Bus 212 route); a green trail leads up from Bratislava Hlavna Stanica mainline railway station (on several of the city’s major public bus and tram routes); a blue trail leads up from Mladá Garda in Nove Mesto (on the Tram 3 and Tram 5 routes); a yellow trail leads up from Krasňany in northeastern Bratislava (near Rača, on the Tram 3 and Tram 5 routes). None take more than an hour to get to Kamzík. b) Change directly at Vojenská Nemocnica to bus 43 (1-2 buses hourly) and stay on until the Lanovka stop, where you’ll see the cable car base just above you. The Cable Car, also known as Lanovky, costs 4 Euros/3 Euros adult/child one way. It runs Thursday through Sunday between 10am and 6pm, with the last departures being at 5:45pm. The journey whooshes you up, quite thrillingly, through the forest to Kamzík – right by the Koliba Expo restaurant we were mentioning. And finally, why is Kamzík so called, after the quirky breed of sheep that inhabit the Slovakian High Tatras? We don’t know. Answers on a postcard, please! GETTING THERE: Detailed right above! NEXT ON THE JOURNEY: From Kamzík, it’s a one-hour walk down to Krasňany and one of the best typical Slovak restaurants in Bratislava, Krasňanska Kúria – and a two-hour walk north to Marianka, Slovakia’s main pilgrimage destination. Before I wax lyrical about one of my favourite ranges of hills and forests (the Small Carpathians, or Malé Karpaty) too much more on this blog it’s probably necessary to give you some context. So here we go. In terms of mountains in Slovakia, it’s the Carpathians that rule the roost. They’re the peaks that start in the Czech Republic, run through the north of Slovakia (and therefore encompassing the Mala Fatra/Vel’ka Fatra, Orava Valleys, High Tatras and Low Tatras chapters under the “Places to Go” section of this site) and the south of Poland, cut the corner of Hungary, charge south through the west of Ukraine and wind up cutting across the central massif of Romania. All-told, they’re longer than the Alps – and Europe’s second-longest mountain range. The Carpathians are well-known, and, in Slovakia at least, much visited. But there’s several less-visited extensions of these mountains: “arms” if you like, that bisect Slovakia. And of these, the Small Carpathians are the most significant. These forested hills run from the edge of Bratislava northeast to their join with the Carpathians proper somewhere outside Trenčin: and they dominate the landscape of all Western Slovakia. Almost entirely tree-clad and never rising above 770 metres, they are a far gentler prospect than the Carpathians – but can nevertheless be dramatic, and full of little-discovered treasures. Englishmaninslovakia loves the Small Carpathians and, by way of an introduction, here’s why. As a result we have by far by largest selection of information about this beautiful range of hills anywhere on the web! Below, we’ve set it out for you nice and easy. You can find links to ALL our posts on the Small Carpathians both under the What’s There? heading (which takes you through our available content by theme) and then our Access heading (which takes you through our available content in geographical order from south-west to north-east). – CASTLES Some of Slovakia’s greatest castles are located here, ranging from stupendous stately affairs like Červený Kameň to a myriad hidden ruined castles like Tematin, Gýmeš or Beckov. – WINE And for something more relaxed after all that energy, the hills are home to the homonymous wine route (the erratic nature, lack of updates and lack of in-English info on the official site mean we’re only linking to our updated posts on this now). The Bratislava suburb of Rača, Svätý Jur, Limbach, Pezinok, Modra and Trnava are the hotbeds of this wine route, and home to many of the wine cellars open for tours and tastings: the happy end product from the surrounding vineyards, which carpet the lower reaches of the Small Carpathians. Read our post on attending one of the many locally-organised wine tastings (in Trnava) here. – RUSTIC RESTAURANTS For something still more relaxing, the trees sometimes give way to reveal a number of great places to eat and drink. Some of these places are proper, rustic, typically Slovak eateries, too – traditional yet refined wooden cottages with huge stoves and bundles of charm – and easily accessible: try our post on Furmanska Krčma above Modra or Reštaurácia Furman above Piešt’any for starters. – BIZARRE BUILDINGS Try our post on Kamzik (a TV mast shaped like a wine bottle in honour of the Male Karpaty wine region) or the poignant tomb-monument of Bradlo, dedicated to Slovakia’s greatest 20th-century hero, Štefánik. Slovakia’s main pilgrimage site, Marianka, is hidden in the hills here. – But above all, what the Small Carpathians are best for is providing a lot of quintessential Slovak experiences (so yes, those undiscovered hikes, those hauntingly ruined castles, that delicious wine, that typical Slovak food – and all in mysterious forested low mountains) and having precious few other visitors outside Slovakia – despite being on Bratislava’s doorstep. – Pekná Cesta, a car park, barbecue area and forestry ranger post above the district of Rača in northeastern Bratislava. It’s possible to drive up here (or walk the 2km) straight up the road of Pekná Cesta from the tram stop of the same name (trams 3 and 5 run here from the centre of Bratislava). This is the preferred start point for our Pilgrimage to Marianka hike: see c) From Marianka below. b) From Devínska Nová Ves, Bratislava. The Small Carpathians falls away into Bratislava only to rear up again for one last, brief hurrah on the city’s western edge, accessed from the suburb of Devínska Nová Ves. There is backdoor access to Devín Castle from here, as well as superb views across to Austria from the top of Devínska Kobyla. Read our destination post about it here. c) From Marianka (on the northern edge of Bratislava). Marianka is Western Slovakia’s key pilgrimage site: a nice village in the foothills with good places to eat – and connected directly to the Bratislava public transport grid. Take bus 37 (hourly) from the bus station under Most SNP to the end of the line. Several hiking trails lead off from Marianka, including the trail to Borinka and on up to Pajštún Castle. Read our post about hiking to Marianka here, our destination post on Marianka here and our destination post on Pajštún here. FOR MORE ON GETTING TO KAMZIK, PEKA CESTA, DEVINSKA NOVA VES OR MARIANKA, SEE OUR POST ON BRATISLAVA’S MAIN TRAM, BUS AND TROLLEYBUS ROUTES TOO! On this blog, we don’t really count Svätý Júr as outside Bratislava, but more as a commuter suburb. Perhaps this is unfair, but there you go. Yet already, the Small Carpathian landscapes are starting to have their undulating rusticating effect on Svätý Júr and as it’s connected via good and regular bus connections from Bratislava’s Mlynske Nivy bus station, and the hills are only a short walk up through town from the bus stop, it makes a viable access point. Read our destination post on Svätý Júr here. The Small Carpathians span two sub-sections on this blog. Up to Marianka (and the hikes around Borinka, Stupava and Pajštún Castle which lie a fraction beyond the northerly extent). Anything up to and including the small village of Svätý Jur. Beyond the limits just specified, the rest of our blog posts on the Small Carpathians fall in this section. 4: Spend a day hiking the trails of the central tract of the Small Carpathians and round it off with a night’s stay at plush Zochova Chata and a dinner of typical Slovak fare at traditional Furmanska Krčma. 5: Hike up to the hidden ruins of Hrad Tematin – and spend the night in the mountain hut there! (see our Around Piešt’any: the Mysterious Ruins of Tematin article for more). 6: Descend into Western Slovakia’s only explorable cave system, Jaskyňa Driny (Driny Cave) near Smolenice. GETTING THERE: As previously detailed, Bratislava, as well as the towns of Svätý Júr, Pezinok, Modra, Piešt’any, Smolenice, Nové Mesto nad Váhom and Trenčin have the best access to the Small Carpathians and, with the exception of Smolenice, have excellent, regular bus connections from Bratislava. Smolenice is more remote, thus has less buses (about every 1.5 hours from Bratislava direct, at a cost of 2.80 Euros, so still not bad). Pezinok, Piešt’any, Nové Mesto nad Váhom and Trenčin are also served by trains every 1.5 hours from Bratislava. NEXT ON THE JOURNEY: From Červený Kameň at the epicentre of this range of hills, it’s 23km east to Trnava and 60km northeast to recuperate at the country’s best-known spa in Piešt’any.